Like Canada, Australia freed herself from direct British rule over a century ago in a civil separation from her mother country. Again like Canada, Australia also became a part of the British Commonwealth. But, unlike Canada, Australia kept the pound sterling as her currency until 1966, after which she converted to the Australian dollar that she uses today. Silver Collectors interested in buying Australian silver coins may already know about the Kookaburra series of .999 fine silver one troy ounce coins issued by the Perth Mint. However, as with Canada, Australia has also had a long history of producing circulated silver coinage. From 1910 to 1945, Australian silver coins ranged from the threepence up, which were made of .925 fine sterling silver. 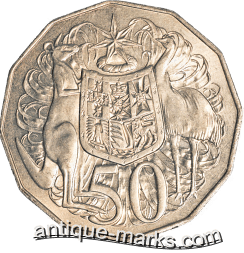 In 1946, these silver coins were debased to .500 fine silver, and after the switch to the dollar in 1966, all Australian silver coins were devoid of their silver content, with one exception. If you’re planning on starting a collection of Australian silver coins (or those of several other Commonwealth countries,) you’ll need to first understand the British pre-decimal system of coinage. Until 1971, the British pound sterling was divided into 20 shillings and 240 pence. Half-crowns and crowns were also produced, worth two and a half shillings and five shillings respectively. The Australian pound used exactly the same denominational system as did the British pound, so if you want to buy circulated Australian silver coins, you’ll have to keep these relationships in mind. The one exception, mentioned above, is the 1966 Australian 50 cent piece. This coin is made of .800 fine silver and is the only regular coin of the Australian dollar (not counting commemorative issues) to contain silver. Australian silver coins aren’t very well known in the United States, and as a result it is possible to find great deals on .500 fine and even older sterling silver Australian shillings and florins in the US. The only problem for American silver collectors and investors is usually shipping: if you plan on buying your Australian silver coins online or through eBay, be prepared to pay high fees on coins shipped directly from Down Under.